Please click on the above link to download the current application and ST19 form. 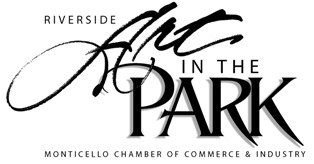 The Monticello Chamber of Commerce & Industry invites you to participate in our 27th Annual Juried Art in the Park Show. This art and fine craft show is held outdoors, rain or shine at Ellison Park on the banks of the Mississippi River in Monticello, Minnesota. Art in the Park runs during the Monticello community celebration Riverfest. Paired with the art show, is the Taste of Monticello which features ten of Monticello's restaurants and caterers serving their favorite dishes on site. While enjoying your favorite food enjoy local talent on stage, free of charge. This show is well established and draws a crowd each year of over 5,000 people. A shuttle bus is provided for fair goers for parking ease throughout the area. This is truly one of the nicest shows in mid-Minnesota. Please consider being a part of the show. Applications postmarked by Friday, April 12, 2019 receive $10 off their booth space. All applications due (postmarked) no later than Friday, July 5, 2019 for acceptance. All applications received after July 5 will be subject to a $25 late fee. The last day to cancel for the show is Friday, June 14, 2019 for a full refund. If you choose to cancel after this date there will be no refund. All participants need to provide their own tables/chairs/tents.